Wanted to let everyone know about some new features available on the NumFOCUS Community Wiki. 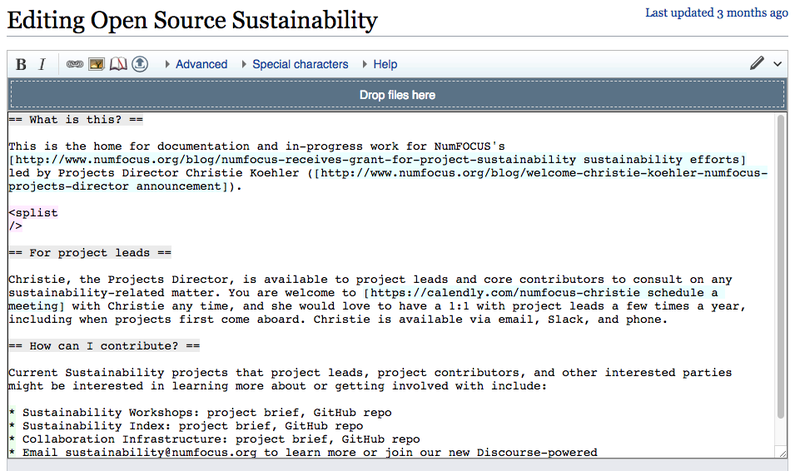 Information about updates to the NumFOCUS Community Wiki lives at NumFOCUS Wiki:Updates. Below you’ll find details about the most recent updates as of today. Do you have suggestions for how to improve NF Wiki? Attend our first Collaboration Infrastructure Community Meeting on 15 November. Most of these features have been implemented in response to my work organizing the 2017 Summit output. We have a significant number of photos of the flipcharts that were created. 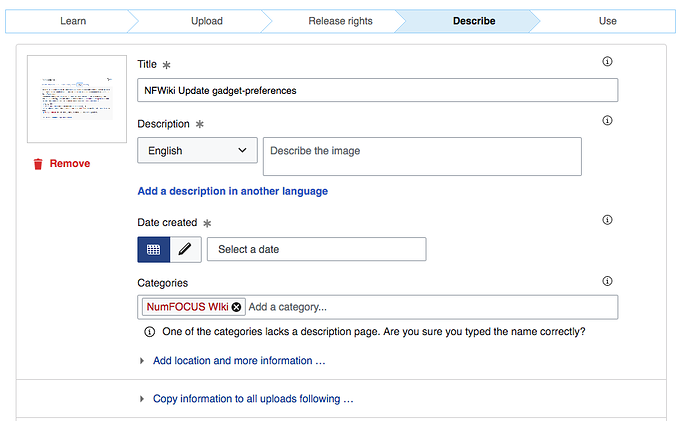 We’re using category information on the NF Wiki to identify and sort the images and to manage the reporting and workflow around these activities. So, I went looking for things that would make uploading lots of images and editing category information easier. I also wanted to be able to construct wiki pages dynamically using different kinds of variables, including category assignment. Mediawiki Gadgets allow you to add features to the wiki without having to install extensions, which requires technical knowledge and administrative access to the server hosting the wiki. 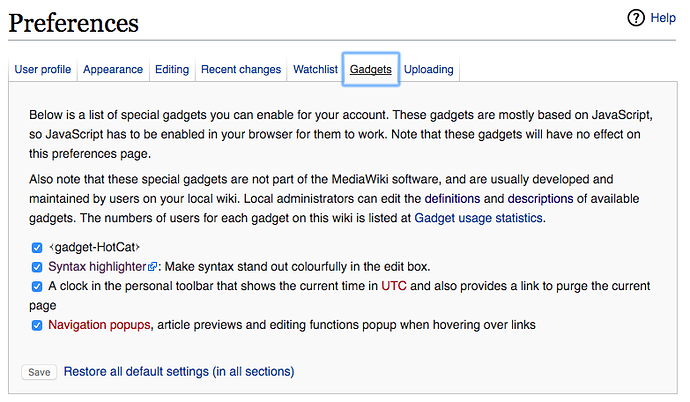 The HotCat Gadget adds a Categories quick bar to the bottom of every wiki page. From this quick bar you can quickly add, edit, and remove categories from a page. HotCat is enabled for all NF Wiki users by default. For usage information see Help:Gadget-HotCat on Wikimedia Commons. 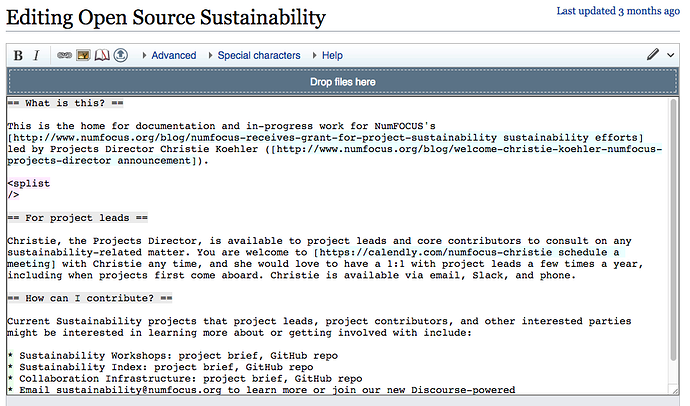 This makes it easier to edit the source of pages here on the wiki (when doing so is preferable to using VisualEditor). To enable this Gadget, visit the Gadgets tab of your Preferences page. The UTCLiveClock Gadget adds a clock that displays the time in UTC with a link to purge the current page. This is useful for seeing the most recent content on pages that are dynamically generated (as with DynamicPageList3, see below). 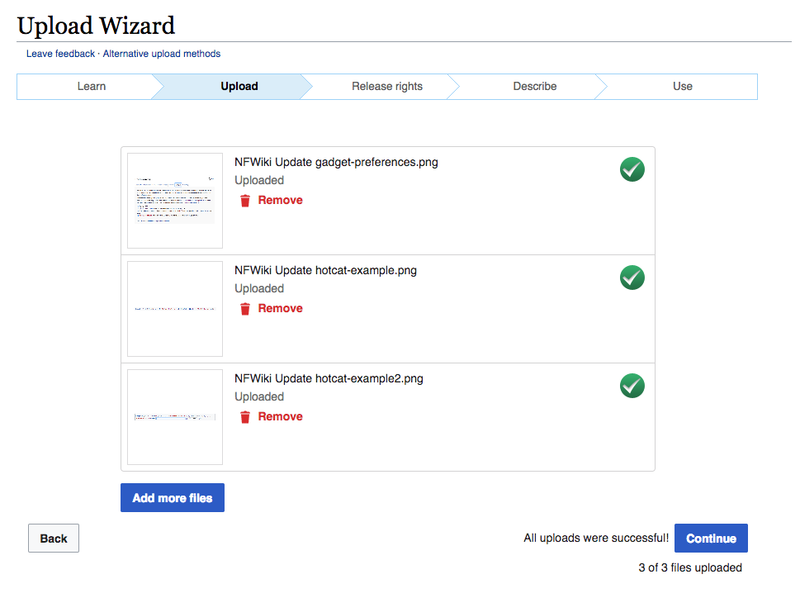 The UploadWizard is available to all NF WIki users at Special:UploadWizard and we have added a link to the sidebar. Information about when a page was last modified is by default available at the bottom of every page. This extension makes that information more obvious by putting it at the top of the page. Last modified can be a helpful signal about how relevant a page’s content might be, and when pages should be updated. This extension is enabled for all NF Wiki users, including anonymous viewers. Example: We are using it on this page to display all output generated from the 2017 Summit. And will automatically be updated as the categories on those images change. This extension is enabled for all NF Wiki users, including anonymous viewers. For detailed usage information, see the Manual at Gamepedia.